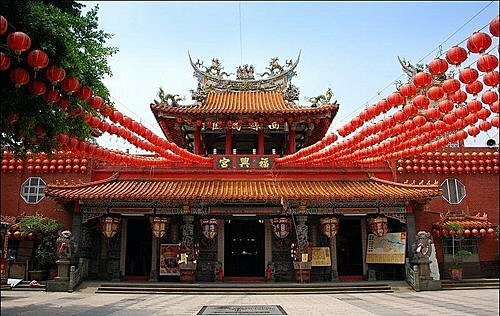 Fu Xing Temple, situated on the Yanping Road, is commonly known as “Mazu Temple on the Old Street”. It was built in 1723 and consacred to the goddess of sea and navigation Mazu. Many antiquities are treasured inside the temple, e.g. the statue of the goddess, eighteen statues representig some arahats, a stone which cames from the Mount Long in mainland China. Moreover, there are some refined cut and polished jade artifacts and some precious works of art. Therefore, inside the temple there are many thousand-year-old incribed boards that increase the rank and honour of the temple: “The peaceful island”, “The good justice follow the breeze”, “Everyone’s senior relatives” etc... The three-floors-style temple we can se nowadays was built and enlarged in 2004. In recent years the most solemn activity of the temple is Mazu’s visit to Dajia (city in Taizhong county). Lan temple in Dajia involves thousands of people who walk to Feng Tian temple in Xingang (Jiayi) and on their way they have their first important rest in Xiluo’s Fu Xing temple. Since ancient times, every year for the Chinese New Year celebrations, in the town thousands of believers and artists come to celebrate it lively with noise and excitement, turning Xiluo into a big party.